I had an interview last week. It was in an area that I've never worked in before and a change I was up for. While the pay wasn't stellar ($0.03 less than the job I turned down the week before), it was a part time gig so I could overlook that. If you're completely confused by my reasoning I can't blame you. When you have kids, they make things complicated. Of course I could have worked that full time job because the experience was great and it was in an area that I get excited about. It just wasn't exciting enough to take me away full time from my kids and everything else going on right now. I put on a nice dress and dropped the kids off with the sitter. I had almost 15 minutes to get to my interview five minutes away. I was cruising and living my best life. Then I had to cross some train tracks which just so happened to have a train on them. A train that slowed down and stopped right in front of me. I called the woman that was interviewing me, only to get an out of office that she was sick. I tried, I really did, but by the time I found another number to call the train was moving and I was two minutes away. I think there are a few ways to really blow an interview, and showing up five minutes late is definitely one of them. I was lucky and they were really understanding (do trains fall under "act of God"?) so we moved past it. Not to toot my own horn, but the interview went really well. I think I might have been made for the position. Everything the company stands for sounded good to me. It was like a match made in employment heaven. I charmed them, they charmed me, we now have a group text going where we send witty GIFs. Just kidding, I don't know how to group text. So aside from being tardy, I slayed that interview. I knew they were going to hire me. I put on my coat and we shook hands and said our farewells and did the obligatory casual post-interview chit chat. "So, what are you up to for the rest of the day?" I wasn't ready for it. I should have been. Everyone always asks. They need to kill any potential awkward silence as you leave and do a last minute psychopath check. They're trying to catch you off guard and delve deeper into who you are. They're no longer your interviewers, they're just Steve and Diane and Steve and Diane are just being friendly and you tell Steve and Diane what you're doing. "Oh, are you moving in Regina?" Still calm, still doing the psychopath check. "Um... Well..." And that was it. I ruined everything. No more group texts. No more funny GIFs. No more future with the company and climbing the corporate ladder all the way to the presidency because you, my friend, have officially bombed your interview. The thing is, that 2018 is another year of chaos because we're moving back to B.C. 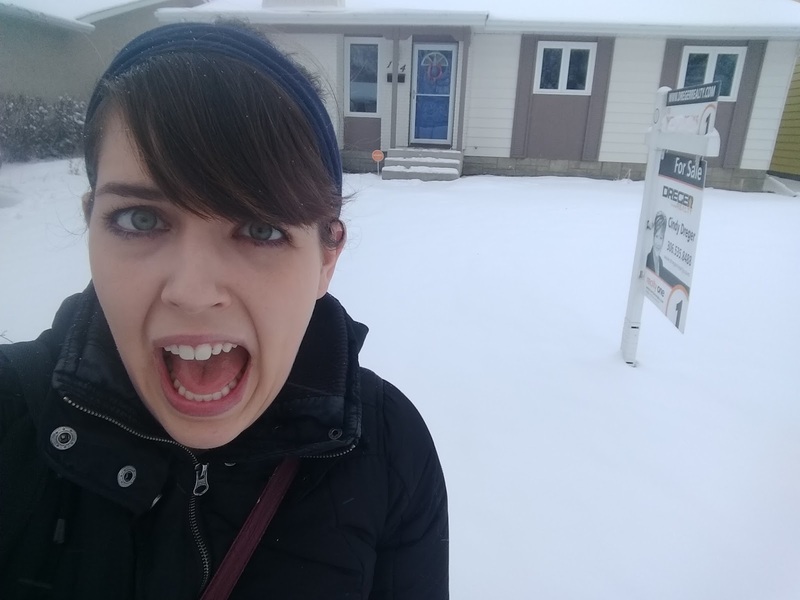 Last week was utter insanity because our realtors, the day before I turned down that job, told me that, in this market, it's a good time to list our house. So I spent the whole week scrubbing and packing and organizing and wondering how on earth my children have accumulated so many toys. When we contacted our realtors we gave them a large window of time that we wanted to list in. We weren't in a rush, we just wanted to get the most value out of our home as possible. So when they said to list and it was right in the middle of my job hunt we said okay and made sure we had plenty of Tylenol on hand for our tension headaches. I cried the whole way home from my interview. If we hadn't had an established timeline for listing I wouldn't have said anything, but I was glad it was out there. I had been feeling a lot of guilt about keeping it secret. Even working for a few months can make a big difference, and we honestly thought we'd be looking at an April list date. That's lots of time to work, wait for the house to sell, then close. I'd been looking for jobs since November so I'd always assumed I'd be committing to around six months of work. I've given up. I'm not meant to work in Saskatchewan anymore and I have a lot of peace about it. I did hear back from the job, and they told me that if our plans change and we don't move to give them a call because they'd love to have me. Then we bonded on the phone over migraine cures and now have a meme email chain going so the whole thing wasn't a total loss. I prayed before going into my interview that I wouldn't get the job if our house was going to sell in February. Time will tell if that prayer was answered, but I'm confident that my job right now is to stay home with the kids, host as many play dates for my mom group as I can, and get this household ready to go to the promised land. If me not working means that we have to subsist on manna in the process, well at least we're getting biblical. I've decided, though, that I'm not a stay at home mom. I don't think that's a title that really fits me. Under different circumstances you could probably call me a home maker. Except, well, I'm packing everything up. I've taken all our pictures off the walls already and made our house feel so much less like our own in order to get it sale ready. So ladies, lock up your books, knickknacks, and family pictures, because I'm a home wrecker and I'm on a mission. First, you better believe I sang your title as I read it. Also, wow. Planning to sell your house is stressful. Add in two kids, a job hunt, interviews, and a train and you my friend are a rock star for keeping it together. Prayers that everything goes smoothly!